1. Heat 1 tbsp oil in a large frying pan and fry the sliced onion for 2-3 minutes. Add the steak and fry for a further 2 minutes. 2. 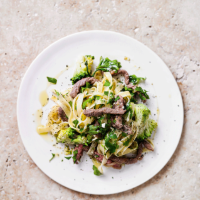 Meanwhile, cook the tagliatelle and broccoli in boiling water for 4-5 minutes until tender, drain and stir into the pan with the steak. 3. Mix together the parsley, garlic, lemon zest and juice and season. Toss into the pasta and serve.